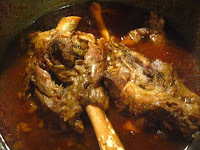 Today I used the last quart of tomato sauce with Persian spices to make lamb shanks for dinner. The spices are coriander, cumin, and dried lime, and I put them in the jar before pouring in the tomato sauce. This way I could make a big batch of tomato sauce and then end up with multiple different flavors of sauce at the end. My grandmother would mix the coriander and cumin together and store it that way; she called it cardi, which means "work," I think. 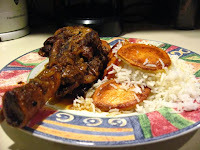 I also made Persian rice with potato tadiq. It didn't just look yummy... it was yummy. Actually, cardi refers to the combination of cumin and coriander and does not translate as "work."